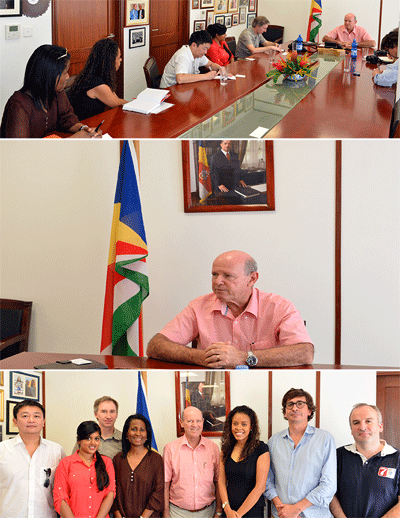 The visibility of the Seychelles has long been measured on the number of publications issued on the destination. Journalists converging to the Seychelles islands, especially those specialising in travel chronicles or current affairs have helped to propel to the world the key unique selling points of this tourism island destination and in so doing making it today one of the destinations rating high on the barometer among the most visible ones. There is always a good reason for journalists to come to Seychelles. In October 2014, when Ethiopian Airlines resumed its flight to the country, the Seychelles Tourism Board firmly committed its support to this African mainland airline as it does to all the other airlines in its skies. Another good news for the Seychelles’ tourism industry was Ethiopian Airlines’ opening of its direct Addis-Ababa, Paris and Brussel routes. The latter, was seen as a good reason for the Seychelles Tourism Board’s office in France to put together an Ethiopian Airlines’ press trip and bring to the islands, a group of French press for first-hand experience of the destination and experiencing flying to Seychelles on Ethiopian Airlines. On January 7, TOURMAG Magazine, ‘’ Le Quotidien du Tourisme’’, ‘’ Deplacement Pros’’, ‘’Oopartir’’, ‘’ Class & Relax’’ and ‘’ Air Journal’’ together with a representative of Ethiopian Airlines arrived in Seychelles for their island experience on most one of the sought after holiday destination. This life time experience by these french press personalities will be shared it to their readers. The journalists have another important mission; to tell their readers about the experience of flying on the Ethiopian Airlines route as they propel the good news about the unique product called Seychelles and its unique attractions. There is one thing that journalists on press trips in Seychelles never miss and this is taking Alain St Ange, the island’s Minister responsible for Tourism and Culture out of his busy schedule for something he has proven to do pretty well ̶ talking about one of his most passionate subjects, the tourism industry of Seychelles. The French press have been passionate in listening to Minister St.Ange and many questions that followed his introductory remarks was the issue of direct non-stop flights which they said was still lacking on the French market. Minister St.Ange emphasised the importance of the French market to Seychelles, and echoed the same message that Seychelles needs a direct non-stop flight on this route to growth this source market. Minister Alain St.Ange also emphasised on the importance of French market to Seychelles and role of Press in promoting Seychelles. The Minister could not conclude his interview without thanking the press for their close collaboration with the Seychelles Tourism Board because without their articles, Seychelles would not be as visible as it is today. Through the destination articles published by the French journalists there is hope the Seychelles visibility and Ethiopian Airlines can get an extra boost in France . The Seychelles Minister ended the press conference by saying “Welcome again to Seychelles. You are invited to discover our islands. What we will be showing is what we are because we are transparent with nothing to hide. We remain sure that when you leave our shores you will all become good ambassadors of our beautiful islands” Minister St.Ange said. Also present at the press conference were Sherin Naiken, the CEO of the Tourism Board and Bernadette Willemin, the Seychelles Tourism Board’s Director for Europe.